I'm actually wondering (since they're sporting him on their shirt) what Che's outlook on Jews would have been. The guy did execute a lot of people during his time. They'd rather not be called racists so they won't step in. I believe the statement is correct. It is not saying "llegal immigrants" but whole Latino population will be subjected to the same harassement. So, "Latinos" whether legal or not, would be correct. Also, it is not saying that this ordeal equates to the six million jews that died in the Holocaust. No where does it say "Jewish Holocaust". It is describing the level of discrimination...how jews were asked to present "papers". A young mother and her two children sit among a large group of Jews from Lubny who have been assembled for mass execution on October 16, 1941. 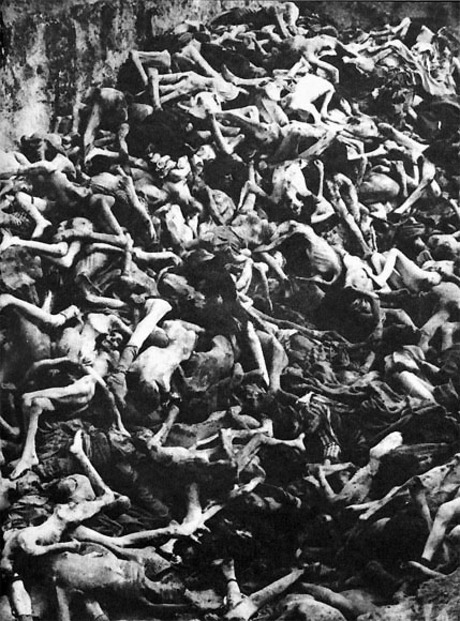 Mass grave at unnamed concentration camp. Or maybe you consider Latinos to be the new Polish while U.S. citizens will play the part of the Germans? I find these references vile and as stated a shameful attempt to equate "keep giving me freebies" with oppression and genocide which rightly angers most. Disgusting in one word, just disgusting. Such a comparison is proof that the pro illegal side is grasping at straws since the Good Ship Amnesty pulled a 'Titanic'. Besides: Columbus's bosses; Ferdinand and Isabella, were the ones who forced the Spanish Jews out of Spain ca. 1492. Does anybody else see the sickening irony here being it is mostly Hispanics who are illegal aliens? Such behavior would be akin to Nazi skinheads; facing expulsion being being someplace illegally, trying to play the 'Holocaust card'. Bravo! Bravo! Bravo! I’m sorry I can’t rep you. THIS is the “real” atrocity. It makes me absolutely nauseous that pro-illegals have stooped to such a vile depth to even entertain the thought of making such a comparison. They can’t possibly sink lower. The Jews had no place to go, I'm pretty sure the current Illegals have a previous home. This is a ridiculous and STUPID comparison made by complete IDIOTS.Jews had NO choice in the matter.Mexicans volunteered for their situation.Jews faced a genocidal Lunatic who used unchecked aggression.Mexicans face a Democratic vote and legally enacted legislation supported by the majority of Americans and yes other Mexican Americans.Only a Complete Idiot would even make the comparison. Last edited by antarez; 05-04-2010 at 08:40 AM..
that in mind i can see the parallells. Of course you can because you're going to claim that Mexico is a hell on earth, like a Nazi concentration camp. Such hysteria and hyperbole. Sure it's got some problems, some poverty but a growing middle class. Actually Mexico is nothing like a Nazi concentration camp. You guys are really grabbing at straws.